We’re basically living in a sci-fi world from 20 years ago. The first time I ever gave thought to the idea of *truly* wireless earbuds, I was in junior high. Sitting in detention for the fiftieth time after being caught listening to music in class, I envisioned something.... Different. Something better. A way that no teacher would ever catch me again! Some sort of bean sized piece of plastic to fit in each ear—almost unnoticeable—that would wirelessly receive music and play it back. See, back in the day everyone would snake the headphone cable underneath their shirt in an attempt to keep it under the radar. Put in one earbud, turn your head to keep the earbud-laden side of your head out of the teacher’s line-of-sight and you were golden. Until said teacher noticed the kid in the back of the class making awkward movements in a painfully obvious ploy to hide some sweet tunes. If you were lucky, you’d be forced to play whatever you were listening to for the whole class. I have fond memories of kids being caught listening to Beiber, Madonna, Slayer, Arch Enemy... Much laughter and/or nods of appreciation was to be had. If you were unlucky, you’d get your phone—er, I mean your Mp3 player—confiscated for a week. Somewhere in between that was where I always seemed to wind up—detention. Of course they got wise to that too. So we had to come up with more and more ways to sneak in a quick song undisturbed, and the upper hand went back and forth between teacher and student every so often. The next time I thought about truly wireless headphones was a bit more recent. About five years ago, a high-school senior, I had just discovered kickstarter and every few days I’d scroll through the “tech”, “design”, and “fashion” sections looking at all of the potentially groundbreaking innovations people were trying to bring to fruition. I hid it behind a strong fitness persona at school, but my nerdiness ran deep and kickstarter was like water to a man dying of thirst. So many ideas! So much creativity, all in one place! I didn’t have much money at the time, but I always told myself that one day I’d invest in some of these futuristic gadgets. Then one day I saw it. Wireless earbuds. In the “tech” section, halfway to their goal with weeks left, truly wireless earbuds. Now at this point in history, there were quite a few products that were marketed as wireless. However... They weren’t really wireless. While it’s true that these items did not have a wired connection to the media device, they still had a wire connecting each earbud, often with a bulky battery pack/bluetooth transmitter in the middle. But on kickstarter—finally—I saw my wireless earbud dream. No wires at all, completely untethered left and right buds, each with it’s own Bluetooth receiver. And then I saw the price. $300. For each side. $600 for the pair. The dream was crushed. I have no idea if those kickstarter earbuds ever made it to production, but I’m sure glad I didn’t buy em. The technology just wasn’t there, and honestly it’s only in the last year that I would say we’ve gotten to the point where wireless earbuds are good enough and cheap enough to consider for the average person. After a lot of research and some testing I picked up a pair of Jabra Elite 65t wireless earbuds. The apple buds were completely worthless outside of Apple’s closed ecosystem, and even if that hadn’t been the case... The Jabras still would have blown them away in all of the categories that are important to me. Bose has a competitor as well, but at the moment they are so far behind as to be barely worth a mention. There are a handful of other brands in the mid range tier ($100-$200), a slew of sub $100 options from Chinese brands you’ve never heard of and a surprising lack of any true high-end options. But back to the Jabras. Fit is excellent, and that’s coming from someone who hates earbuds that form a seal. I decided to try it and I’m glad I did. 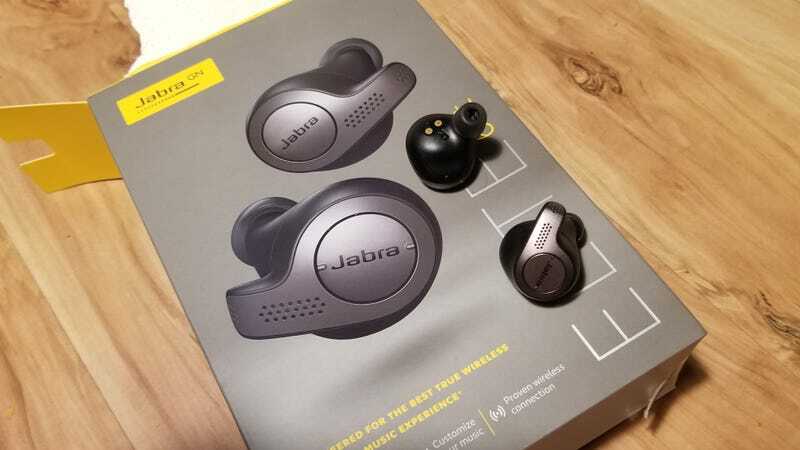 These are wearable for hours, and unlike Apple’s wireless option, the Jabras will stay in no matter what you do. They are securely locked in place. I’ve been using them at the gym, while skating, doing gymnastics... Yep. They’re not coming out unless you take them out. The earbuds will play music for about 5 hours straight, and the tiny case that holds the buds will supply a full charge to the buds two additional times before you have to recharge everything. This is the the one area where Apple wins. Despite sharing the same 5 hour run time, Apples earbud case will supply 4-5 full charges. Both options have quick charging, but it seems like Apple had a slight quicker quick charge. Connectivity is great. We’re at Bluetooth 5.0 and after the initial pairing, whenever I turn the buds on they automatically pair with my phone. Dead simple. Power button on each bud and bam. Connected. Apparently Bluetooth 5.0 is good to 800 meters, which I have not tested and likely never will. Left earbud has two buttons. Tap one button and the volume raises. Long press that button and you go to the next song. Tap the other button and the volume lowers. Long press that button and you go to the previous song. Right earbud has one button. Tap the button to play/stop music or a answer/end calls. Long press the button to bring up your assistant (Google now/Alexa/etc.). Super simple. They’ve got a pretty good dust and water resistant rating and seem to be pretty skookum. They look a hell of a lot better than the Apple earpods or most of the other competitors in-ear, and it sounds like their two year warranty is simple to cash in on if needed. While they’re comfortable, I still don’t like a full seal in my ear. That’s why I stuck with bose soundsports for so long. They were the only higher end earbud I could find that rested on the folds of your inner ear instead of sticking a spherical blog of rubber into your ear canal. Someday I might attempt getting the bose tips to fit on these, but that could be tricky. Honestly those are my only complaints at the moment. Techgearlab and Tom's both have pretty good reviews up. Feel free to ask any questions!